If you are designing a building automation enclosure that includes Ethernet or BACnet/IP communication, chances are you are looking for an unmanaged Ethernet switch to tie things together. Budgets are always tight, and there is a temptation to utilize inexpensive household grade switches from manufacturers such as Linksys or D-Link. However, we feel you are being penny-wise and pound-foolish. 24VAC (or DC) Powered – No need to find a place to plug in a wall-wart power cube (or install a receptacle). Our switches can operate from the same 24 VAC power source as all your other components. Secure positive locking screw terminal strip connections – no banana-plug here. Our hard-wired power connector is vibration proof and tug proof. DIN-rail or panel mount – No trying to balance a desktop switch somewhere in an enclosure while building custom shelves, using Velcro, resorting to duct tape or just hanging from Cat 5 cable. 10/100/1000 Mbps Speed – No configuration necessary. Our ports automatically configure their data rate, duplex, and utilize the Auto-MDIX protocol so straight-through or crossover cables can be used. Activity/Link and Data Rate LEDS – Each port visually conveys key information to tell you what's happening on your network. 5, 8, and 16 Port Models – We have the size you need, all with a similar form factor. Some models even offer fiber optic ports for those long-haul connections. Compact Size – Widths as narrow as one inch and a vertical form factor means we blend seamlessly with other nearby control equipment. Available panel mount for shallow depth (less than one inch). Rugged Metal Enclosures – We use metal enclosures for strength and EMC protection. All Skorpion switches are EMC immunity tested. Wide Temperature Range – Our switches are 0° to 60°C rated. Office grade products are not. UL 508 Listed – Many jurisdictions require control cabinets to be UL 508 compliant. Using unlisted components within your enclosure can create issues and added expense far beyond the few dollars you saved up-front. In addition to unmanaged switches, the Skorpion family also offers Managed Switches and Diagnostic Switches. These come in the same form factor and with the same features outlined above. Should your needs change, upgrading to a more complex switch is a simple as unclipping one and clipping in another. 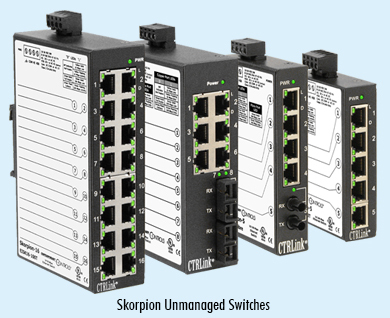 Visit the Skorpion Unmanaged Switches product page to learn more.